Get a freezer for food storage - you'll be glad you did! 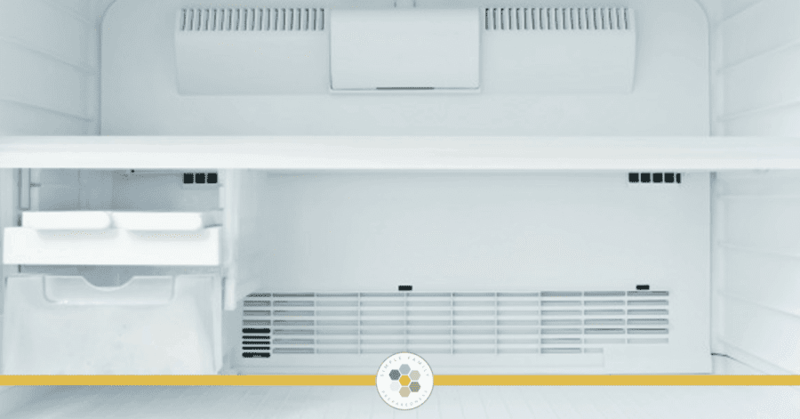 Using a freezer for food storage is a somewhat controversial topic–and I get it. The main concern–what happens when the power goes out–is a valid one. So, let’s talk about it today! I love when I get a lot of questions that all center around the same topic! It helps me know what to write blog posts about! So, don’t ever hesitate to email me a question or leave a question comment on a blog post! I love it. Should I invest in a freezer for food storage? Will a freezer save me money with food storage? What food can I preserve in my freezer? What do I do with my food if the power goes out? Today, I’m going to share the “ultimate” guide to using a freezer for food storage, by answering four important questions. You ready? Question #1: Why use a freezer for food storage? #1 – You will rotate through your food more easily. Most people are very familiar with the food you might find in a freezer: meat, cheese, vegetables. You already know how to use these things. They aren’t scary or confusing like wheat or freeze dried food can feel sometimes. This means if you use a freezer for food storage you will more naturally USE that food; you will rotate through it and not waste it. #2 – You’ll save money. Having a large dedicated freezer for food storage allows you to take advantage of good sales on expensive items such as meat. For example, I love everything I’ve ever bought through Zaycon; the prices are great and the meat is very high quality. But the catch? You have to buy in bulk. Having a freezer makes this possible. Once a quarter or so I buy 80 pounds of chicken breast (and they are HUGE and beautiful) for $1.69/lb. A chicken breast of similar quality would cost me $5.00/lb at the local market. That is a savings of over $1000 a year!!! But I’m only able to do that because I have a place to put all that meat: my freezer! Repeat that process for beef, bacon, shredded cheese, and more, and you can save a LOT by stocking up when things are on sale. That means that you will earn back that cost of the freezer (and the extra electricity) quite quickly. #3 – It’s a great way to save garden extras. I garden. I LOVE it. But to be completely honest, I don’t love canning. It takes a lot of time, and I don’t love the texture of most canned foods (except for home canned peaches….yum). So, it isn’t worth it to me. But when you garden, you almost always have a surplus. Freezing that surplus is a very easy way to save it, which then limits how much I have to spend on store bought produce at other times of the year. Now, I know some people DO love canning, and I think that is fantastic. But if you can’t get everything canned or dehydrated quickly enough or you want to better preserve the texture of the food, freezing gives you another option for preserving it. PLUS, freezing your food will preserve more nutrients than canning or dehydrating it (because heat kills nutrients). #4 – You can store things you might not be able to otherwise. You can’t really dehydrate cheese – well you can dehydrate it and then turn it into a powder, but then it doesn’t really work like fresh cheese. And while freeze dried cheese works just like fresh when hydrated, it is crazy expensive. But guess what? Shredded cheese freezes really well! When you have a freezer to use as a part of your food storage, you will find there are many things that you can store well in the freezer that it might not be wise (or affordable) to store using other methods. #5 – Using a freezer for food storage will save you time. You can store complete meals in the freezer that may come in handy on a busy night. You can also store things like bread dough, pre-chopped veggies or other half-way completed meal components that you can then grab and make a meal with in less time. Question #2: What food storage can I keep in my freezer? Cheese-Block cheese doesn’t do well (it will crumble when de-frosted), but if you shred it first, it does great in the freezer! Ricotta, cream cheese, and cottage cheese all do well. Meat-Most any meat (even lunch meat) will store well in the freezer. Use freezer bags (or even vacuum seal it) to get the longest shelf life. Nuts-Nuts have lots of oils in them, so they will go rancid fairly quickly on your shelf. If you find a great deal, stock up and throw them in the freezer! Baked goods-cookies, bread, rolls, waffles, pancakes, brownies, cupcakes, and more all store well. Fresh herbs-If you have extra from your garden, put them in ice-cube trays with a bit of water or stock and freeze them for use all year! Dough-I like to make a large batches of bread and cookie dough and then store the rest in the freezer to save me time later on. Avocados-They can be expensive, so when they go on sale, stock up! Puree them, and then freeze ’em! Powdered eggs-I can’t get through a whole can of my powdered eggs in the 3-6 month opened shelf life. So, I keep them in my freezer to extend that shelf life up to a few years! Fresh eggs-Yep! They freeze well! Crack them one at a time into an ice-cube tray. Then, let them thaw in the fridge when you need them. Corn on the cob-Leave the husk on, and put it in an airtight bag. Fruit-You can freeze fruit, but it will likely be a bit soggy when you de-frost it. However, it will still work great in baking or in smoothies! Veggies-Some veggies are similar to fruit (they go a bit soggy), but they still work great in soups and casseroles. And there are some that keep their texture quite well–broccoli, peas, onions are just a few. Bell peppers and mushrooms will work great in fajitas. Butter-This is one of my favorite things to stock up on when it’s on sale. I LOVE real butter (hate margarine), so I grab a LOT of it when it goes under $1.99/lb. Milk-Milk freezes well, but it does expand, so pour just a little out of the jug before you freeze it. This can be helpful for empty-nesters who want to take advantage of the savings of buying milk in a gallon size but can’t get through it fast enough. Bananas-If my bananas get too ripe on the counter, I peel them and stick them in a Ziploc in the freezer. They are great for smoothies and banana bread/muffins! Question #3: What is the best way to store food in my freezer? There are a few things you should know to make sure your freezer is worth its weight in gold! Always allow warm food to cool down in before you freeze it. How well packaged your food is really does matter. Invest in quality freezer bags. Double or triple wrap things in quality plastic wrap or foil. Invest in a vacuum sealer if you can–you can use it just for those things that will be in the freezer for more than three months to save money. No matter what you are freezing, try to get as much air as possible out of the package/bag before freezing it. (The only exception to this is liquids which do need some space to expand). Always re-package meat into air-tight freezer bags (or vacuum seal it) to avoid freezer burn. If you don’t vacuum seal it and it will be in the freezer for more than three months, consider using two freezer bags. Blanch vegetables before you freeze them for the best results (here is a great article on that). Date and label everything you put in your freezer. Things look different when frozen (you might not be able to tell the difference between ground beef and stew meat). Plus, you want to be able to always use the oldest food first. Use baskets, cardboard boxes, etc. to organize food into groups/categories to make it easier to find what you are looking for. Make sure your freezer is always frost free so it runs efficiently, and you don’t waste money. Question #4: What do I do if the power goes out? All right, onto the big question: People get nervous about storing hundreds (or even thousands) of dollars of food in their freezer because of the possibility of losing all that food if the power goes out. 1 – Most (not all) power outages don’t last more than a few days. Your food will survive that long with the tips I’ll give you. 2 – If the power outage is longer than that, you can share your food or trade it for other things (like medical care if someone in your family is hurt or shelter if your home is destroyed). In a true disaster situation, most people simply won’t be able to provide everything their family needs. No one is a doctor, engineer, chef, gardener, and more all rolled into one. Plus, not everyone will have all the supplies they need–toilet paper, powerless cooking tools, water, food, etc. You will be able to trade that food for other things you may need, but can’t provide yourself. It will not go to waste. 3 – Don’t rely on freezer storage alone. While using a freezer for food storage is smart, using only a freeze for food storage is not. You should have other shelf-stable food stored as well. Make sure your freezer is always, always completely full. Use milk jugs/freezer bags/soda bottles full of water to fill up empty spaces if necessary. A full freezer will keep food cold far longer than a half-empty one. I keep milk jugs full of water on a shelf in our garage (where my freezer is). When I pull things out of my freezer, I replace them with a milk jug. When I bring home a large amount of freezer food, I remove the milk jug and put it back on the shelf. Move your meat to the bottom of the freezer. This is where it is coldest, so your meat (likely the most expensive thing in your freezer) will have the best chance of staying frozen there in a power outage. Consider installing a freezer alarm and set the maximum temperature limit to 37-38 degrees. This way, you know when you need to pull out your food and start using it. (If your food has been above 40 degrees for more than a few hours it could be unsafe to eat (depending on exactly what it is). Yeah, okay, but what if the power goes out? I have kept food frozen for five days in a cooler as we moved from California to Utah and it sat in the back of our van. If a quality cooler can do that, so can your freezer! Turn the temperature down to 0 degrees if you have any pre-warning about the outage (or possible outage). Do not open your freezer unless absolutely necessary. Wrap your freezer in blankets to help insulate it even further. If the next town over has power, drive over and get some dry ice to add to your freezer as this will keep it cold for a long time. If you have a generator, use it to “power up” your freezer for three-four hours each day. If your freezer alarm goes off and the temperature is at 38 degrees, start using the food. Share it with neighbors. Trade it for other things you need. Check your food from the top down (as stuff at the top will thaw first). If your food still has ice crystals, it is fine–just re-freeze it! If there are no ice crystals, use a probe thermometer to test your food. If it is still under 40 degrees, you can simply re-freeze it. If it is just over 40 degrees, get it to the fridge and eat it soon. If it is over 45 degrees, toss it. If you lost the food in your freezer, contact your insurance. Sometimes you may be able to get reimbursed. Now I have a question for you! What is your favorite “food storage” to keep in the freezer? Is there a way to put in a spreadsheet everything that you have listed that is great for freezing? I would love to keep that in my emergency preparedness binder like you have had many other printables! That is a great idea! I will add it to my “to do” list! Also, how long do eggs last in the fridge. I get so many different answers. Thanks for letting us know that they can be freeze. What do you mean when you say? Wrap your freezer in blankets to help insulate it even further. Hi Evy! I mean to take a blanket (or two or three) and wrap it around your closed freezer and then tie it with a rope of some sort to better insulate it. Does that help? Anyone who lives in a colder climate and experiences winter should take advantage of the unlimited freezer space that your unheated garage, unheated enclosed porch or even a balcony if you live in an apartment building can offer!!! Even though I don’t like winter, I love the fact that I can store all kinds of extra food in my enclosed unheated porch/room that I have! I put it in bins that mice can’t get into and store things like big bags of flour, nuts and other things that I want to extend their shelf life for an extra 5 months. I also have an upright freezer out there that I have running in the summer but turn off in the winter because it naturally freezes and is a great way to organize everything because of the shelves. An upright makes seeing everything and accessing it so easy. I highly recommend to anyone to get an upright freezer, it makes freezing a joy. It is great for small containers. I freeze whey, fat drippings and other items that are in small containers and those don’t work well in a chest freezer unless you store in boxes or bags- in an upright it is easy to keep track of them on the shelves and you can put them in trays to pull them out easily. Here’s another great tip- I use an old broken freezer that makes a great animal proof compartment that I use in the winter in my unheated room to store more food. There is a great way to find freezers for free, at least where I live in Canada on the buy and sell website Kijiji (look for the buy and sell websites in your area). Most buy and sell now have a “Free Stuff” area where people who don’t want to throw things out or don’t want to have the trouble of selling them and with all the recycling and re-purposing that is now popular, many people give away working freezers (that is how I got my upright) and non working ones that, as I said, make great small animal proof compartments. So try and use the out door temps if you can and if the power goes out then you can easily transfer it into bins into your garage or porch. Even if you don’t have an enclosed porch, if you have an old freezer that locks you may take a chance putting it in that outside and take a chance that no animals will get in if it looks like you may lose the meat anyways(if the power is out for a few days). Good thing bears are asleep in winter! This is a great way if you live in an apartment and have a balcony on a higher floor to be able to have some extra food stored in bins that you may have otherwise not had space for. Great tips J M. Thank you! We just had an unexpected power outage for the last 3 days. I’m now researching on what I can do better for the next emergency. Great tips! I wish I had stumbled upon this earlier. Family of 7 and I lost 2 freezers full of meat because I stockpile when they are on sale. I will defiantly be utilizing your tips. Thank you. My late mother-in-law baked cake layers and froze them in plastic wrap. So convenient during the holidays. it seems to be an oxymoron to prepare for a long term disaster but consider your freezer (which in an outage would only last a few days) as part that ‘preparedness’. I am looking into getting a couple of deep cycle batteries that I can recharge with a solar panel or houses electricity (if I have it) that will power my fridge and two freezers in an outage. I don’t want to rely on freeze dried foods but I do can and dehydrate my own food. I like to store bread and tortillas in air-tight freezer bags. They freeze very well. I just take the slices or tortllas we need for a meal put them in the toaster or a griddle and we have delicious warm bread or tortillas. That’s how I can have all kind and sizes of tortillas and bread handy for any ocasion. Thank you Misty for all that good information. Favorite food: Bread, with two added bags to reduce drying, Meat of any kind, food surplus that is/was given to us. I do need to go through my big upright freezer again to see what is still in it, maybe rearrange it so I can use it. I also need to do the bottles of water, pop bottles would work better because they would go where I keep the bread and are about the same size. I would keep my gas tank full in my car. Then get a inverter 850 watts or more. Then hook it to the car battery. Start your car but not in your garage You will be able to run most modern freezer off it until the gas runs out. This will be a cheep generator for those who can’t afford a generator. Never tuch a inverter to a positive wire or battery post. THanks for the tip Jim! I cook batches of penne and spaghetti, drain it and then put some olive oil in and toss to coat. Then I portion it out and put it in the freezer. When I need some I just pull it out and thaw. It also makes for very quick mac and cheese by sprinkling shredded cheese and heating in the micro.